Tommy Wells is the director of the Department of Energy and Environment (DOEE) for Washington D.C. Appointed January 2015, he is chiefly responsible for protecting the environment and conserving the natural resources of the District. In 2009, when he was a DC Councilmember representing Ward 6, Tommy crafted The Anacostia River Clean Up and Protection Act of 2009, to implement $0.05 fee on disposable bags. This landmark legislation prompted thousands of District residents to curb use of plastic bags and instead opt for reusable, green alternatives. Seventy-five percent of DC residents reported a decrease in their use of disposable bags once the bill took effect on January 1, 2010. 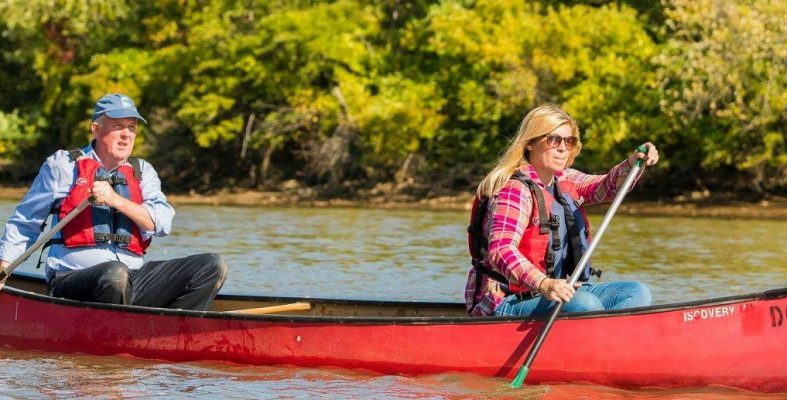 The legislation also established a fund to restore District water bodies, including the Anacostia River; support the distribution of reusable bags in the District; install trash traps; and provide environmental education for District students. These and other efforts, championed by Tommy, have helped position the District as a model for sustainable green living for jurisdictions nationwide. PYXERA Global Senior Fellow Laura Asiala sat down with Tommy to gain some insight into the remarkable efforts—and impact—to curb marine debris and ocean plastics in the U.S. capital, in anticipation of The Global Engagement Forum: Live 2018. Director Wells pitches in with the Conservation Corps to help remove debris and garbage. The work you’ve done in the District of Colombia has been remarkable, and set an example for other watershed cities. Where did you get your original inspiration? I took a vacation in Switzerland with my family, and I was just struck by how clean the waterways and roads were. I decided I needed to do at least one thing before I stood for re-election, so I went home and did the research. I knew there was no appetite for a ‘bottle bill’ (requiring retailers to charge and refund deposits on beverage containers), but plastic bags had become a big (trash) issue. I asked my staff to come up with a strategy on plastic bags, and initially I said, “Let’s just ban them.” But then we actually looked at the data. One of my staff members found that in Ireland a 20-cent charge for a plastic bag reduced trash by 80 percent. We looked around the country; we knew that New York City had been working on a bill, but it had not gone through. In rural Virginia, there was interest in a bag bill, because of the issue of bags getting caught in farming equipment, but it also had died. But in DC, you were able to get this—a bag ‘fee’—through. What was your approach? After we did the initial research to decide which issue to focus on—plastic bags—we invited the heads of the grocery stores in the region to come and talk to us, and they did. We asked, “What is the role of the bag?” and we found out that it was customer convenience, and that plastic bags cost retailers two cents per bag compared to paper bags which cost about five-to-six cents each. With the extreme pressure on profit margins in the grocery business—sometimes three cents on the dollar—we realized that forcing the use of paper bags would drive up their costs. By putting a required price on the bag, we forced the question, “Do you need a bag?” which meant that people actually had to consider it. By putting a required price on the bag, we forced the question, “Do you need a bag?” which meant that people actually had to consider it. In addition, the grocery leaders requested that we not make this an issue of grocery stores but to extend the bag fee—which was always intended to focus on food—to other retailers who sold food and beverages—for example, fast food, restaurants, and liquor stores. This was a really good point, because those locations were also providing plastic bags which were contributing to pollution. We were now applying this fee evenly. When we talked to the people who owned liquor stores, they worried that their customers would see this bag fee as a way to ‘sock the customers,’ rather than a fee being imposed by the government. So we also coupled the introduction with a strong advertising campaign—we had signs on all the buses that said ‘Skip the Bag; Save the River,’ so that everyone knew where that fee was coming from. The Department of Energy and Environment is working to remove waste from the District’s watershed. I’m impressed with the engagement you had with relevant businesses in order to really understand their point of view. How did this approach extend to the public sector and fellow lawmakers? We looked at why bills like this had failed in the past and we found that opponents—typically the American Chemistry Council and the Plastics Industry Association—made the point that such a fee was essentially a ‘tax’ on the poor, by increasing the costs of their groceries. However, when we did the research, we found that by examining the point at which most food stamps were redeemed—Save-A-Lot and Aldi’s—those stores were already imposing a bag fee. So really, the poor were already subsidizing the use of plastic bags. The bag fee which we proposed would simply make that more equitable by applying it to everyone. We took all of that information and input and we crafted the bill, and I went to every single council member and made the case. When it was finally put forward, we had 11 of 13 council members introduce it. The opponents had no real local support to work with—we had already addressed the objection most often cited—and the bill went through. What’s happened as a result? We saw a significant decrease right away—within six months of the bill passing—65–75 percent reduction in plastic bag trash, and then it leveled off. The main thing is that people were asked at the point of sale whether or not they wanted a bag, so people had to think about it. A lot of times, a small purchase doesn’t require a bag. It’s not automatic anymore. We saw a significant decrease right away—within six months of the bill passing—65–75 percent reduction in plastic bag trash, and then it leveled off. Some people still want the convenience of the bag and they pay the nickel, and that results in a fund which now amounts to approximately 2.5 million dollars annually. We deploy those funds in a lot of ways, but one key way is that we work with nonprofit organizations—Groundworks DC, Anacostia River Keeper, and Anacostia Watershed Society—who use the money to purchase ‘Bandalong’ litter traps, installing and maintaining them in key areas to prevent trash from flowing into the Anacostia River, which then flows into the Potomac River, which then flows in the Chesapeake Bay and out to the Atlantic Ocean. We redeploy the funds in a number of other ways as well, including river clean up and education. 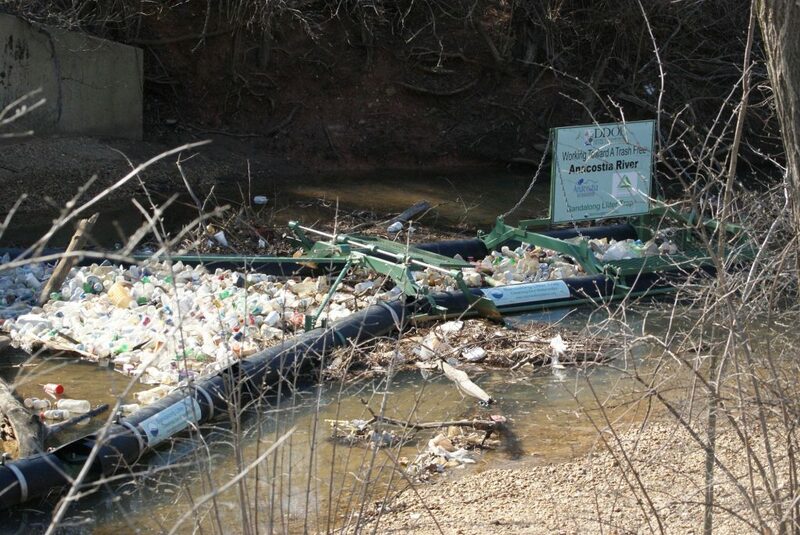 Bandalong litter traps such as this one help to stop plastic bottles and other waste from clogging the Anacostia. How have you influenced others with these results? We were able to get Al Carr of the Maryland House of Delegates to introduce the same bill at the same time. It didn’t pass, unfortunately, but Montgomery County (Maryland) Executive Ike Leggett came over and met with our team. He introduced it in Montgomery County, and it passed. The thing that we see primarily now are plastic containers—water bottles, soda bottles, basically anything that contained a beverage. Glass bottles are in that too, but it’s primarily plastic. There hasn’t been a bottle law passed in the United States in the last 30 years. Manufacturers used to want the bottles back, but now the market is all single-use containers, and they don’t want them back. When we tried to pass a referendum, retailers and manufacturers pulled out all the stops and defeated it. The good news is that Coca-Cola has a mission statement now to recapture up to 100 percent of the product packaging by 2030 and ensure that all materials are recyclable. If they all did that, it would be huge—especially if they didn’t wait until 2030 to start—so they could be part of the solution and not the problem. All images courtesy of Department of Energy and Environment. 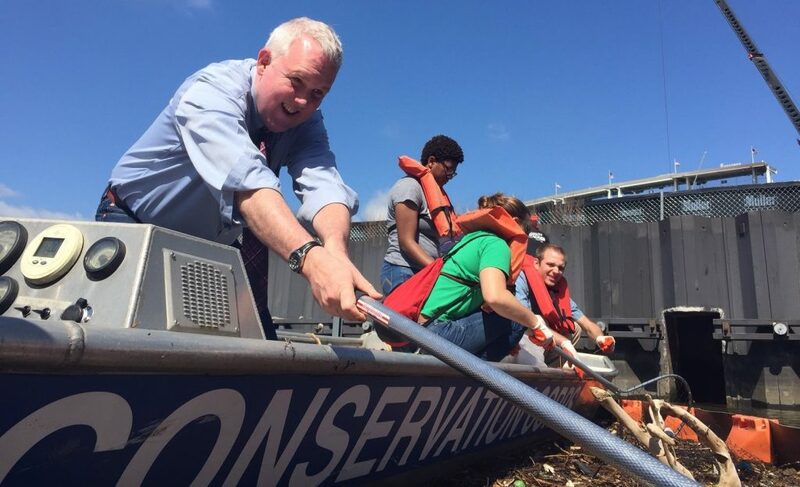 Header image: Director Tommy Wells tours the Anacostia River.